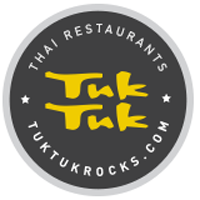 Online ordering menu for Tuk Tuk Thai Grill (Lakewood). Tuk Tuk eateries have a distinct combination of quality Thai cuisine, quick service, and practical prices all served in a trendy and stirring environment. At Tuk Tuk we take your eating experience to an inspirational level. We believe the food you eat affects the life you live. Eat better, live better … and at Tuk Tuk you’ll never be stuck waiting for the good life to begin. We are committed to providing our guests with a brilliant dining experience that exposes you to the healthy, nutritious, and authentic secrets of our menu. A few of our dishes include Shrimp Salad, Curry Noodle, and Mongolian Beef. We're located a block south of Grand Army of the Republic Hwy at the corner of Union Blvd and 2nd Pl. We're right by St. Anthony Hospital. Order online for carryout!